According to a Dow Jones VentureSource report released this morning, fewer US-based venture-backed companies exited in 2011 than the year before, but the deals netted more capital as the median price for M&A and buyouts, as well the median amount raised in initial public offerings, spiked. 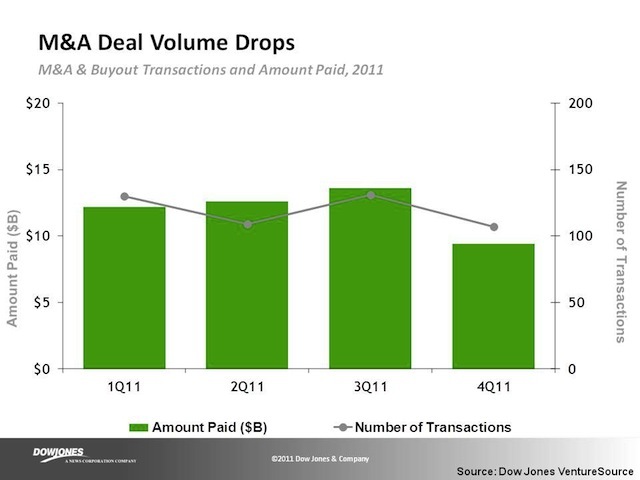 Dow Jones VentureSource says there were 522 exits of venture-backed companies in the US throughout 2011, which represents a significant 4 percent drop in deal activity compared to 2010. However, the capital netted from those exits increased an impressive 26 percent in 2011, compared to the year before. Notably, for the first time in five years, acquisition activity in the fourth quarter of 2011 did not outpace the third quarter. In fact, Q4 2011 was apparently the least active quarter of the year. According to Dow Jones VentureSource data, the median price that was paid for a company increased 77 percent (to $71 million) in 2011. To reach an M&A or buyout, companies raised a median of $17 million in venture financing, 12 percent less than in 2010, and took a median of 5.3 years to build their company. In 2011, 45 companies raised $5.4 billion by going public, significantly more than the $3.3 billion raised by 46 IPOs in 2010. A lot of that comes from the IPOs of tech giants Groupon and Zynga, which combined raised $1.7 billion by hitting the public markets. Other notable tech IPOs included LinkedIn, Pandora, Yandex, Tudou and Renren. And now, all eyes on Facebook. 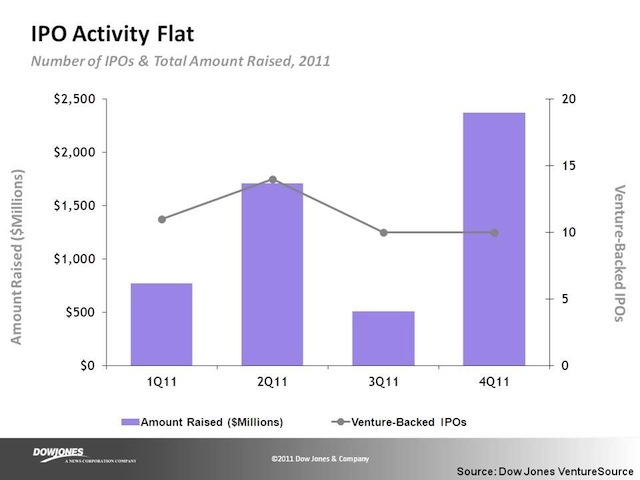 The median amount of venture capital raised prior to an IPO rose 17 percent (to $85 million) in 2011. The median amount of time it took a company to reach liquidity fell to 6.5 years, from 8.1 years in 2010. In other words, companies seem to be needing more capital but less time to get from founding to IPO in this day and age.